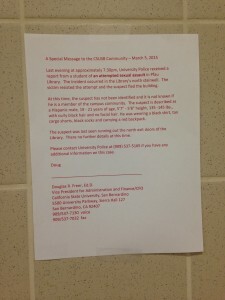 An attempted sexual assault at CSUSB‘s Pfau Library was reported by a student to University Police on Wednesday, March 4, at approximately 7:30 p.m. The assault occurred in the Library’s north stairwell. The victim was able to resist the suspect, who fled the scene. The suspect was reported to be wearing a, “black shirt, tan cargo shorts, black socks and carried a red backpack,” according to Freer. Flyers detailing the situation were posted around the campus, and an e-mail was sent out to students, faculty, and staff. University Police have requested that all students and staff report any information on the incident at (909) 537-5165. Originally published on coyotechronicle.net (March 5, 2015). **This article was written collaboratively with Shane Burrell (Coyote Chronicle Sports Editor).